Plumtree Church | About ME! About ME!Home / Church Life / Big Ted / About ME! This page is all about ME! (My favourite subject [snigger!]). As you know, I'm Big Ted and you can usually find me sitting (snoozing quietly - I don't snore no matter what Little Ted says) in the Children's Corner in St Mary’s, keeping all the other toys in order and being cuddled by visiting children. 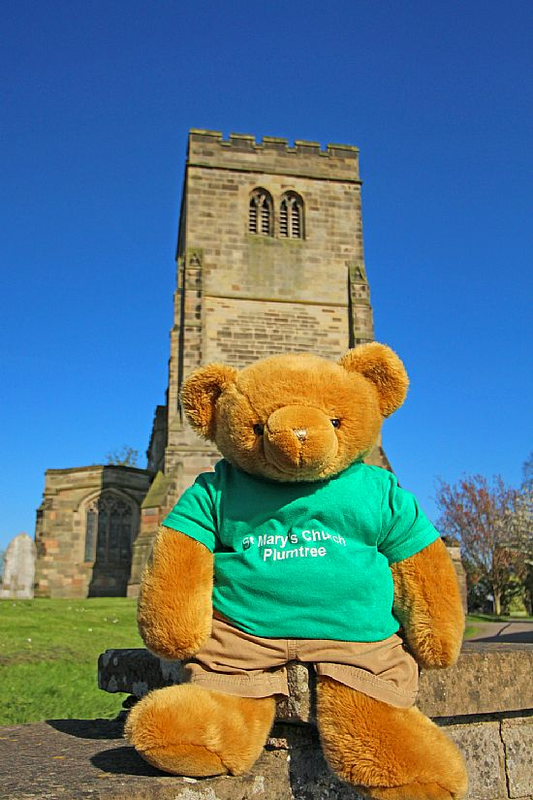 But I also have another job; an important role as Roving Ambassador for St Mary's Church, Plumtree (and I wear a special T-shirt to let everyone know it!). That means I get out and about from time to time. As well as these web pages, I sometimes write articles for the parish magazine. I used to have a book (called Big Ted's Book) that I kept in church - but I'm a 21st century internet bear who has moved on [cyberspace-type snigger]. One of my special tasks is to visit as many other St Mary's churches as I can. I usually do this when I'm away on my holidays, but sometimes I just take the day off and visit a local St Mary's (the nearest is at Bunny). So far I've visited over 175 St Mary's churches in 20 different English counties (and some in Wales as well). You can read all about them on my St Mary's Churches page. I've met some really nice people and seen some lovely churches. Unfortunately, there are an awful lot of St Mary's churches so I may not get to visit them all. If you want to take me anywhere on your adventures, just come and have a chat. I'm really rather photogenic and have splendid fur which looks 'specially good in the sunshine. When I'm at home in the Children's Corner, I sit with my friend Little Ted. I've let him say a bit about himself here. Hello everyone, I'm Little Ted. 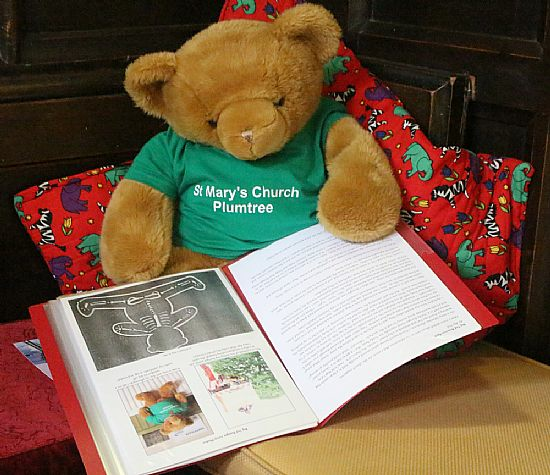 I live here in the Children's Corner at St Mary's Church with Big Ted and all the other toys. As you can see I'm wearing a very posh outfit that was knitted specially for me. Actually that's not quite true. 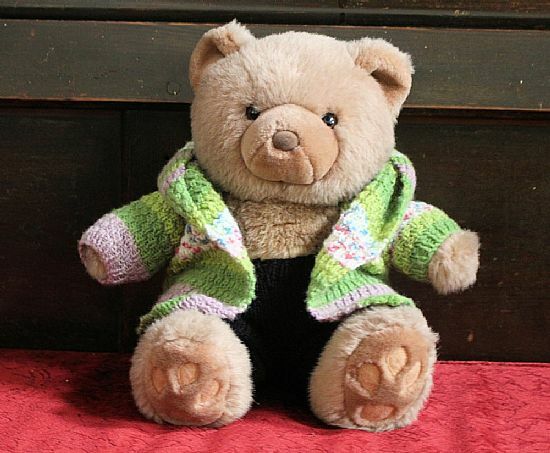 It was really knitted for Big Ted, but because he's such a BIG Ted it didn't fit him at all. But it fits me perfectly and the jacket has a nice hood that I can snuggle into when the weather's cold and the heating's off. I stay here in church when Big Ted goes off on his excursions. When he comes back he tells me all about it (I think he exaggerates some bits too - I mean, who's ever heard of a bear riding on a dinosaur!). Please come and say "Hello" when you are in church; it will be great fun to see you.